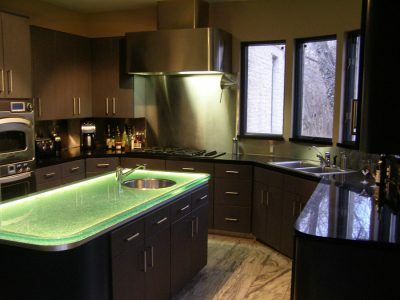 CBD Glass creates a variety of countertops, such as: kitchen, bathroom, island, bar, raised bar, etc. 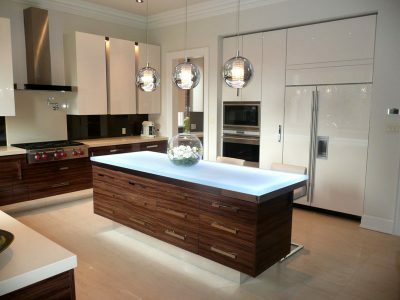 Glass kitchen island is one of the most popular choices. 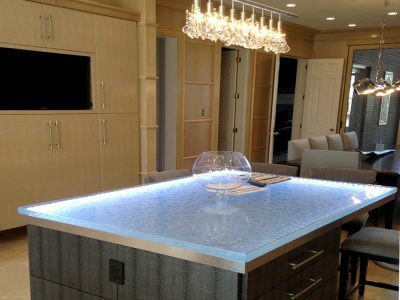 A kitchen island stands right in the middle of the room, so why not use glass for your countertop material to make it into a statement piece? You will be able to customize every little detail about your kitchen island countertop. Starting with thickness and color of the glass. The typical thickness for any countertop is 1 1/2″; however, that can be modified according to your personal needs. The customer also gets to choose the texture of the countertop. Most popular one is the “Melting Ice” texture, because of its interesting look. “Melting Ice”, especially when used with LED cool-white lights, gives the whole room a very intriguing, sharp, and stylish look. Another popular choice is “White onyx”. In comparison with “Melting Ice” texture, it gives a different look to the kitchen. “White onyx” is more of a smooth, relaxed, milky look. 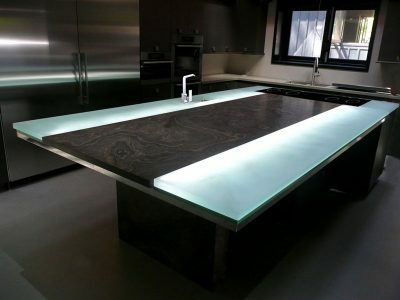 Once again, when used with LED lights, the kitchen island countertop has a more dramatic, unique, and stylish effect. It really achieves that “one-of-a-kind” look that makes your kitchen feel so elegant. The decision of which particular look to go for, is a hundred percent up to the customer. 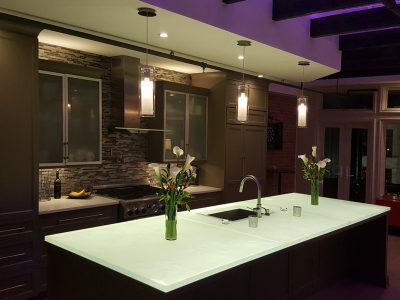 The only thing you need to keep in mind is this: in order for your glass countertop to be installed with LED lights, there must be a substrate where the lights can be placed. 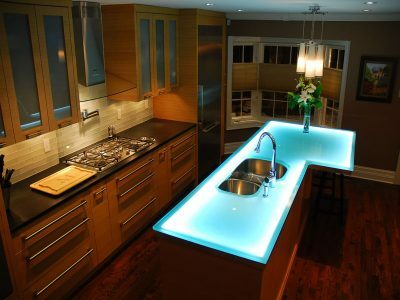 In a kitchen glass countertop, the LED is usually placed between the wall and the glass. 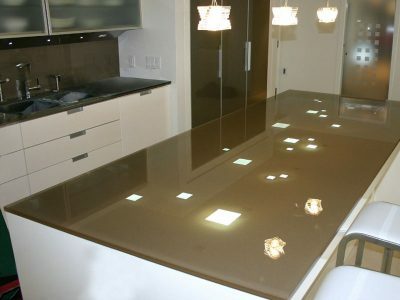 However, because the kitchen island does not have a wall, the substrate is put under the glass. 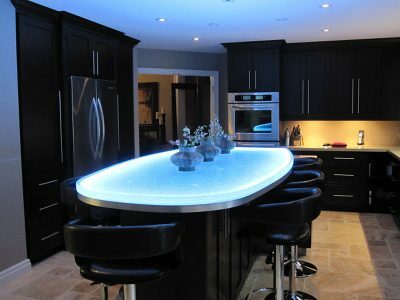 As you can see in most of our pictures in this section, the substrate is used for all glass kitchen island countertops where LED is present.